Two headers from Chris Wood earned Burnley a narrow win over Cardiff City on Saturday. The three points all but ensured safety for the Clarets and all but consigned their opponents Cardiff to the Championship next season. It was fitting that the breakthrough in this game came from a set-piece, as an excellent in-swinging corner from Dwight McNeil was begging for touch and Chris Wood was more than happy to oblige, and gave his side the lead. Joe Bennett sees yellow for a late challenge on Ashley Barnes. Tempers flared as the game dragged on and as Cardiff grew more desperate. Neil Warnock threw caution to the wind by introducing all his attacking players but it backfired when his side conceded again right at the death, with Wood capitalising on a defensive mix-up for one of the easiest goals he's scored all season. This fixture was tightly poised and presented a stern test for Burnley who required one more win to secure Premier League football next season. With three of the top six left to play in their final four games, safety was still far from assured for the Clarets. 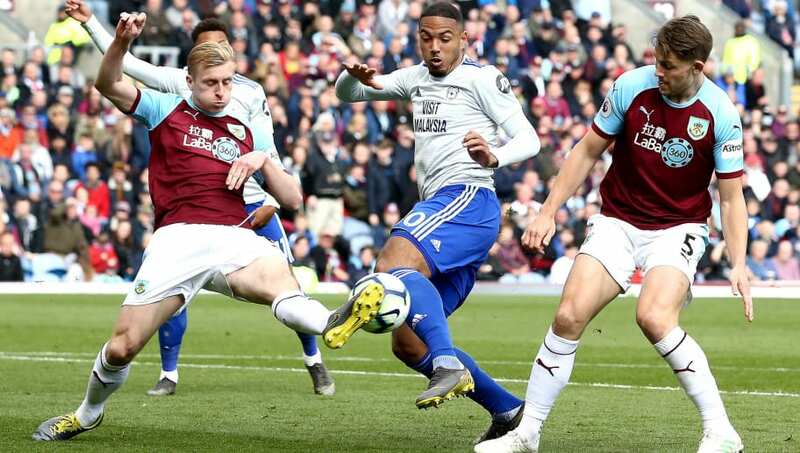 The opening goal put Burnley exactly where they wanted to be as they threw men behind the ball to stave off a Cardiff onslaught. The Welsh side are the second lowest scoring team in the league and they just didn't have the quality to break down the resolute Burnley backline. It wasn't necessarily pretty but that's job done for the Clarets, was there ever a more typical Burnley performance than this. Starting XI: Heaton (6), Lowton (6), Tarkowski (6), Mee (5), Taylor (6), Hendrick (6), Westwood (8), Cork (7), McNeil (8)*, Barnes (7), Wood (8). STAR MAN - Dwight McNeil stepped up when it mattered most for Burnley today, setting the Clarets on their way to an important with a delightful assist for the opening goal of the game. Warnock was rightfully furious with some controversial officiating in Cardiff's last home game, that result opened up a significant gap to safety. And the Bluebirds' boss will have more reason grumble after this one as a handball penalty was at first awarded and then taken away from Cardiff. A lengthy discussion ensued between the referee and linesman over two separate incidents involving Ben Mee in the space of a minute. It's the second that will raise the most questions with the defender heading the ball into his own hand, unintentional perhaps, but it certainly helped him control the ball and make the clearance. Officiating alone won't relegate Cardiff though, and they let themselves down at key moments again. It's an excellent set-piece delivery that sends Cardiff behind but it's inexcusably stagnant marking from a team in their position. Cardiff did come out with some real furore in the second half, but they failed to even test Tom Heaton. Sean Dyche's side don't often give goals away cheaply and Cardiff were left casting a nervous eye towards that all-important Brighton game. STAR MAN - Neil Etheridge has been one of the few success stories of Cardiff's campaign. There was nothing he could about the goals, but the keeper was outstanding throughout. Burnley brought themselves some much need respite for the fixtures ahead, they face top-four duo ​Chelsea and Manchester City in their next two fixtures. Cardiff have another crucial away trip to relegation rival Brighton next before the face the considerably larger challenge of title-chasing Liverpool.